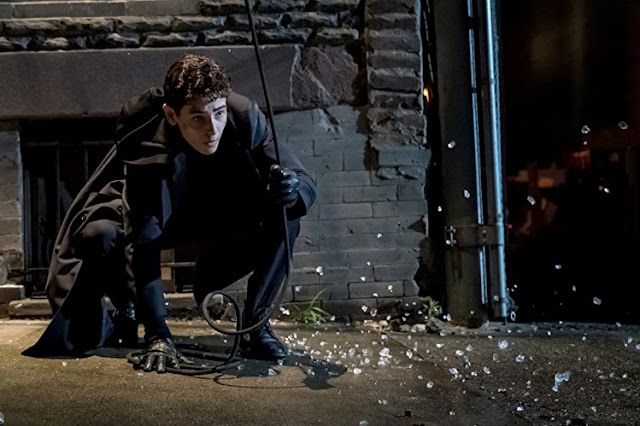 Welcome back to another recap of Fox's Gotham. This week's episode is "The Fear Reaper"—or, as I like to call it, another random villain finds a reason to psychologically torment Jim Gordon. Spoilers ahead. Also, trigger warning for violence and suicide. After a viewer discretion warning and a video montage recap, the episode begins with the GCPD searching Crane’s old house, but he’s not there. They instead find chemicals Crane used to recreate the toxin (come to think of it, I’m wondering where he got all the adrenal glands this time), along with one of the thugs from last episode—only now he’s raving and tied to a scarecrow post. So is that the old scarecrow costume, or did Crane use that to make his suit and find another one to stuff him in? Bruce gets stuck in a holding cell but is able to leave thanks to a handy-dandy expensive lawyer. He tells Gordon that he was on the roof and just happened to fall through (which is a pretty terrible excuse). Gordon asks why he was there, and he claims he was looking for Selina (which is a slightly better excuse). Gordon lets Bruce out, but he says they are going to talk about it later. I’m glad that the writers aren’t trying to make Gordon blindly oblivious to what’s going on with Bruce. He's practically a father figure to him, and they’ve known each other for three years; he should be able to tell when Bruce is lying. Whether or not he finds out that Bruce is a vigilante, I want there to be more conflict between the two characters as they evolve. I think Gotham is setting that up nicely. Meanwhile, Crane confronts the asylum warden that sold him out and doses him with the toxin—mostly out of revenge, but he also claims that he’s doing it to cure the man’s fear. Crane says you can only cure your fear by embracing it as he did (which is usually Batman’s shtick, but whatever). The warden begins to see his worst fear: clowns. Back at the GCPD, Lucius asks what Bruce was up to, noting the brick and dust residue on his clues. Alfred and Bruce come up with a ridiculous story that he’s been learning to rock climb. Lucius doesn’t buy it and tells him to be careful, as rock climbing can be dangerous. Hmm, what does this remind me of? Crane makes the warden see clowns and tells him to embrace the fear. And as far as clowns go, these are pretty scary. They remind me of the knockoff Joker gangs in Joker: Death of the Family. Of course, I’ve never seen It, so I may not be the ultimate authority on creepy clowns. The warden shoots practically everyone he sees because he thinks they’re all clowns that want to catch him. While the warden is busy going nuts, the Penguin marches into GCPD (a sure sign that it’s about to get real). He’s accompanied with the press and issues a public challenge to Gordon: capture Crane, or admit that he can’t keep the city safe. In the next scene, Selina and Tabitha both meet at a mysterious location thanks to anonymous invitations from Barbara, who is (GASP) not dead. Shocking. Barbara apologizes to Tabitha and says she wants to start a new enterprise with her and Selina: selling weapons to all the thugs licensed by Penguin. It’s a pretty good plan, although I’m not sure if it’s Barbara’s or Ra’s’ (since she’s apparently been trained by him, according to an article from Comicbook). Tabitha says she can’t forgive Babs for killing Butch and that there’s no way back from that (give it time, Tabs, Grundy will be here any day now). Selina is open to the idea, however, and promises to talk to Tabitha on Barbara’s behalf. It’s a little odd to see Selina and Babs interacting, since we haven’t seen them on-screen together since season one (ya know, back when Barbara still had most of her marbles). Bruce tells Alfred he’s going back out, and Alfred says that even though he can’t stop him, he’s not going to help him get himself killed. Bruce argues that he “feels more alive than ever,” but that’s obviously why he’s making mistakes. He’s not cautious enough. Bruce, you’re not faster than a speeding bullet (unlike some people). So Gordon goes to the asylum alone, and Crane (watching him via video monitors), is elated to have a chance to get back at his father’s killer. Ivy tries to help by telling Barbara that she can talk to Selina and Tabitha, but Penguin tells her to shut up. It’s kind of sad that their odd friendship from last season is falling apart so quickly, but I guess it’s not totally surprising. Penguin never had the same bond with Ivy that he had with Ed, and he probably only sees her as a hench-girl. Ivy, on the other hand, still has the mind of a fourteen year-old, so of course she’s going to react childishly. Penguin goes on to tell Barbara that he’ll be keeping a very close eye on her business and won’t let her get the chance to usurp him again. He also wonders aloud who could have financed the club, since Barbara wouldn’t have the resources on her own, and tells her that he’ll find out. If the benefactor is, as I suspect, Ra’s al Ghul, Penguin’s going to have hard time intimidating him. Gordon is confronted by Scarecrow, who know wields a scythe, and I’m genuinely curious to know how he got it. Was there one just lying around the Crane estate? Does Gotham have a really edgy Party City? Did he rob a museum? Honestly, the possibilities are endless. Anyway, Crane claims that his father dosed him with the fear toxin out of love. While he’s not exactly wrong (Dr. Gerald Crane was trying to cure his son of fear), Crane’s transformation is still disturbing. He doses Gordon with the toxin, which causes him to see Lee, lying in a bathtub filled with blood. She tells him that she’s going to commit suicide just so that she can get away from him. A razor appears in Gordon’s hand, and Crane (or maybe just Crane’s voice in Gordon’s head) tells him to join her, to show her his love by joining her in death. But Gordon ultimately decides to live and goes after Crane. Crane admits that his father thought he was weak but points out that he’s not weak anymore, and the fight continues. Bruce goes after the gang from the other night, but it turns out they were luring him into a trap. They pull off his mask, and one guy is positive he’s seen his face before, but the others tell him to shut up. Bruce manages to get loose, use a makeshift flamethrower to get the thugs to back off, and even use a . . . But when he reaches the ground, Bruce finds himself face-to-face with the gang’s leader—seconds before Alfred shows up and knocks him out with what looks to be a crowbar. It’s nice to see that Alfred is still there to protect Bruce, even though he isn’t entirely on board with the whole vigilante thing. In the next scene, Tabitha and Selina argue about whether or not to take Barbara’s deal. Tabs points out that she chose Nygma over her and Butch; Selina replies: “So what? Nygma’s a Popsicle now.” She also points out that the three of them would be a lot stronger together. 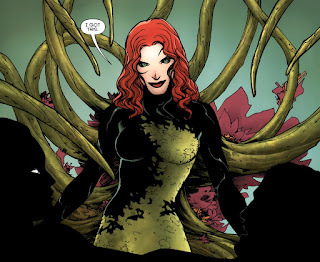 Ivy appears out of the shadows and says she hates Penguin and wants in. Selina wants to let her join, but Tabitha’s completely against it, so it looks like Ivy’s pretty much on her own for now. Look it up, it's a thing. And over at Wayne Manor, Bruce and Alfred get into a shouting match about whether or not Bruce can handle himself on the streets. Lucius interrupts to drop off a lightweight, bulletproof suit he developed during his time at Wayne Enterprises for military purposes. It also has communication equipment so Bruce and Alfred can communicate "whilst climbing rock.” Honestly, Lucius Fox is the kind of friend I aspire to be. Selina and Tabitha meet up with Barbara. Tabs agrees to join her business, but on one condition: she gets to chop off one of Barbara’s hands. Tabitha explains that since Butch lost a hand to Penguin and she lost a hand to Nygma, the best way for her to get back at by Barbara is by cutting off her hand (Gotham logic at its finest). Selina is freaked out by this ultimatum (like any sane person would be), but Barbara doesn’t back down and extends her hand. Tabs pulls out a cleaver and is all set to do it but ultimately decides that Barbara’s being sincere, spares her hands, and agrees to join her business. TBH, I’m not completely convinced that Barbara’s really sorry for what she did. Also, considering that she’s working with someone who has a Lazarus Pit, losing her hand probably wouldn’t have been a major sacrifice. Penguin returns to the GCPD to taunt Gordon for failing to catch Crane and even offers to, erm, financially support any cop who complies with the licenses. Gordon decries this, but once again, Harvey tells Gordon that he can’t side with him because he’ll risk losing the other officers. Honestly, Harvey’s a much better leader than Gordon at this point. He may make some morally questionable decisions, but he’s in a difficult situation, so I can’t really blame him. Over in what appears to be Gotham’s Chinatown, Ivy barges into the shop of a man who’s apparently used to her coming and taking whatever she wants. He tells her to go away, but she gets him to reveal his safe of powerful potions, which were apparently created by wise shamans and are capable of . . . something. He warns her not to take them, but Ivy (still possessing a middle-schooler’s brains and impulsiveness) knocks back a few any way. Her face morphs and her eyes briefly turn black, which makes me wonder if her design on this show is going to be New 52-esque. I don’t mind that she’s getting more powers, but I kind of wish she’d made the mixes herself. 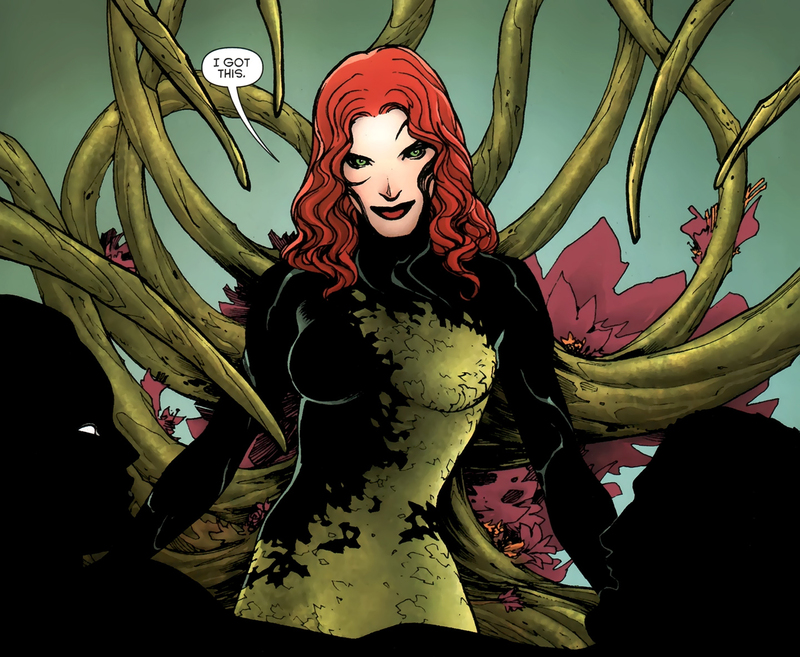 The show has a tendency to downplay Ivy’s skill with plant-based chemistry, but I think that’s her most interesting (and useful) trait. Harvey and Gordon discuss what they’re going to do over a drink. Harvey mourns the days when Falcone was in control, which gives Gordon his next brilliant plan: go to Falcone for help. Harvey warns him against it and reminds Gordon that he did kill Mario, but, in typical Gordon fashion, he doesn’t listen. Meanwhile, Bruce runs across the rooftops of Gotham, revelling in his new gear, before donning the mask that completes the guise. I personally prefer the cloth mask he was wearing under the hood, but this one definitely looks more durable, so I can forgive its clunky design. Honestly, the fact that they let Bruce suit up in this show at all is a miracle, so I’m not going to complain much about his suit. I’m sure they’ll give it upgrades over time. Overall, this episode was . . . alright. It didn’t really feel like the horror-fest that Fox was promoting, but since I’m not really into horror, that didn’t bother me. I guess I had hoped for more psychological terror, but that will probably come up later, since Scarecrow is still on the loose. I liked watching Bruce get in and out of trouble, although I hope that he and Alfred don’t spend every episode arguing about his vigilantism. I think the Barbara storyline has potential. As far as second episodes go, this one is probably better than “Selina Kyle”, but it definitely falls behind “Knock, Knock” and “Burn the Witch.” All in all, I’m still interested to see where the show goes next. CoSA VFX Gotham Season 3 - VFX Reel from CoSA VFX on Vimeo. Feel free to comment below with your opinions on the episode. Did you like Gotham's version of Scarecrow, or do you prefer Nolan's version? How do you feel about Bruce's suit? I want to know all your thoughts about "The Fear Reaper."